A hybrid tea rose the Ashram Rose is one of our favourites. And their is a lot to like about this rose named Ashram. 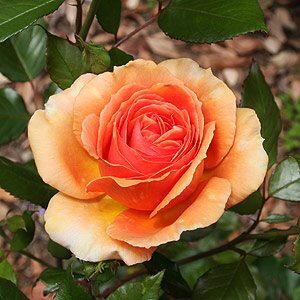 This is a coppery / apricot orange hybrid tea rose, a vigorous growing type with flowers that show a nice soft mottled appearance. Reaching around 1m to 1.3m in height Ashram is a rose bred in Germany and released by Rosen Tantau in 1998, it is available both as a bush rose and a standard. Large full flowers that repeat through late spring to summer. The flowers appear on long stems and make a good cut flower. A delicate fragrance,best described as fruity with a touch of spice, they do look great in a vase. Foliage is a deep green and is reasonably mildew and black spot resistant. Flowers are great for picking and the delicate fragrance makes then good for indoors. Like many Hybrid Tea roses, the Ashram Rose will spot flower into autumn. Deadheading through the season will help prolong the flowering period. Having good disease resistance Ashram is an easy care rose under Australian conditions, mulch well and maintain a cool root run. Fertilise with an all purpose or specialist rose fertiliser in early spring. Being a reasonably tall yet tidy growing rose, Ashram is suited to growing in containers as well as in the garden. Photos of Ashram rose used, are property of and copyright by Australian Nurseries Online, all right reserved. If you are trying to find the Ashram Rose try Treloar roses on our Rose Nursery page..